Six years after running down the low-cost model, Jet Airways and Kingfisher Airlines are betting on it to keep running. On August 25, 2003, Gorur Ramaswamy Gopinath, an ex-Army officer who ran helicopter services on charter, launched India's first low-cost airline, Air Deccan. Food was not free on board and travellers had to pay for their meals. The tickets didn't carry seat numbers -- those who came in first got the best seats. Gopinath's unique selling proposition was rock-bottom ticket prices: The fares he offered were half of the other airlines in business. Indian travellers had never seen anything like this before. The rush of passengers on Air Deccan was huge. Rivals were smug and confident that Gopinath had committed hara-kiri. Naresh Goyal's Jet Airways, which lorded over the Indian skies, publicly declared that the low-cost model was a sure recipe for disaster. Unlike Europe and the United States, India did not have separate low-cost airports with cheaper landing and parking charges which are essential to keep costs down. Cutting out the meal would indeed save some money but not enough to offer such low prices and still make money. Then, two years ago, in 2007, Goyal acquired full-service carrier Air Sahara for Rs 1,450 crore (Rs 14.5 billion) and quickly turned it into a 'value carrier' called JetLite. He may not have called it a low-cost carrier but the fares on offer matched those of the low-cost carriers. Not to be left behind, in 2008, Vijay Mallya's Kingfisher Airlines, which had positioned itself as a premium airline, bought Gopinath's Air Deccan with the promise that it will add to it the zing of special customer service (which meant meals on board) akin to its full-service operations. But it remained a low-cost service. The message was hard to be lost: The low-cost model was here to stay. Last fortnight, the wheels of destiny turned one more time. Not content with one low-cost carrier, Jet Airways announced the launch of a new all-economy, no-frill service called Jet Konnect. For all practical purposes, it is another low-cost service with low-cost fares. For the new service, the company has diverted about 20 per cent of the capacity of its full-service carrier, Jet. The service will be the same as on a Jet flight, except there will be no food. As many as eight aircraft will be pressed into service under Jet Konnect for 54 flights a day on select routes. This, mind you, is just the beginning. 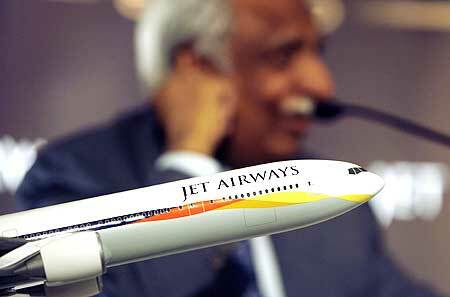 Jet Airways plans to add another aircraft to the Jet Konnect fleet by the end of May. Once this happens, a quarter of Jet's capacity will have become all-economy and no-frill. Jet Konnect will then operate no less than 68 flights a day. "Jet Konnect has a very flexible and rapidly-deployable capacity. This is being planned as a response to the customer who prefers lower fares. We will watch the loads of Jet and then think of expanding Jet Konnect further," says Jet Airways executive vice-president Sudheer Raghavan. The strategy, claims Raghavan, has already started paying dividends. Revenues on the Jet Konnect routes have improved substantially, according to him. "Our total customer carriage has gone up by 27 per cent on Jet Konnect flights. Also the pace of our bookings for the Jet Konnect flights after it was introduced has gone up by 1.35 times as compared to the period prior to the announcement," adds Raghavan. Meanwhile, Mallya's Kingfisher has quietly diverted about 10 per cent of its full-service capacity to its low-cost arm, Kingfisher Red, which comprises the Air Deccan fleet. As a result, Kingfisher Red has now got 24 flights a day. "On certain routes, we saw more opportunities for a low-cost model, and that is why we have decided to increase the capacity of Kingfisher Red on these routes," says a senior executive of Kingfisher Airlines. More is on the way. 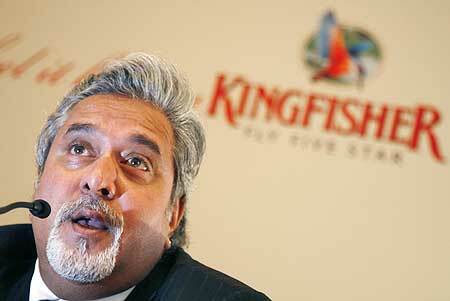 Company executives say there is a plan is to convert all single-class aircraft (all economy) to Kingfisher Red. Six years after running down the low-cost model, Jet and Kingfisher are betting on the same business model for survival. The shift is serious enough for many sector experts to pronounce the death of the full-service model in the country. "What we will see is that the full-service carriers will connect the four or six metros where there are corporate travellers willing to pay for business class travel. For the rest of the country, there will only be the low-cost model. 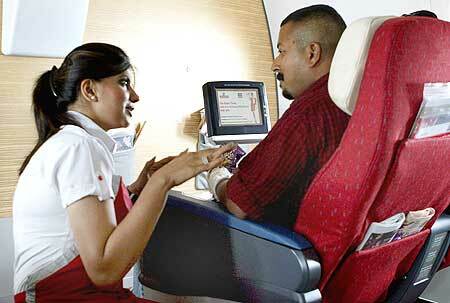 After all, why should travellers not go for airlines which offer 30 per cent cheaper fares?" says Kapil Kaul, who heads Centre for Asia Pacific Aviation in India, an international aviation consultancy. "It's an international trend. All airlines across the globe are going low-cost. Travellers just want to reach their destination and do not look at gourmet meals. In the US, even full-service carriers don't serve meals any longer. That's what is happening in India now," adds Keyur Joshi, the chief operating officer of travel portal MakeMyTrip.com. In India, where most flights are completed within three hours, food is no longer a big draw. Cash-strapped travellers are happy with low-priced tickets, provided the service is on-time. The axe has actually hung for quite a while over the full-service carriers. Their passenger load factor has fallen steadily for several months now, while that of the low-cost carriers has steadily gained ground. To make matters worse, the economic slowdown has driven passengers en masse to the low-cost carriers. For instance, Jet's PLF of 65 per cent in April was way below that of most other low-cost carriers including its own JetLite which logged PLF between 68 per cent and 72 per cent. Naturally, the low-cost carriers have ramped up their share of the passenger traffic. One year ago, they accounted for 47.8 per cent of the traffic. It has risen to over 50 per cent now. CAPA estimates that low-cost carriers like IndiGo or SpiceJet will break even and start making cash profits by the end of the third quarter of this year (June-September 2009). In comparison, the three full-service carriers (Jet, Kingfisher and state-owned Air India) have accumulated losses of over Rs 8,000 crore (Rs 80 billion) on their books. Profits don't seem to be anywhere in sight. Their answer to the situation is clearly more low-cost flights. What seems to have played on the mind of the full-service carriers is that corporate travellers have begun to desert them in favour of low-cost carriers. The economic slowdown has forced companies across sectors to cut down their travel expenditure. One way out is to travel low-cost. According to industry estimates, low-cost carriers have as a result got almost 35 per cent of this market now, up from 10 per cent just a year ago. This, mind you, is a big market. 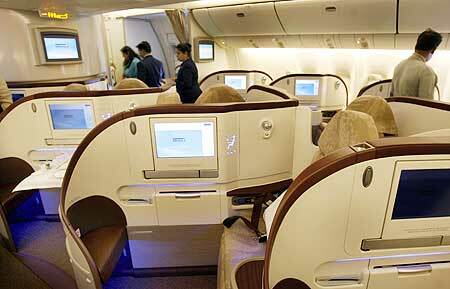 Corporate travellers account for over 60 per cent of all air passengers in the country. In spite of all the fare cuts, the full-service carriers were losing their corporate customers and could do nothing to get them back. Companies like Wipro and Infosys and a whole host of pharmaceutical companies have given clear instructions that junior- and middle-level employees should travel only on the low cost-carriers," said an executive of a Delhi-based low-cost carrier. Several companies have been pushing the full-service carriers for low fares. To get these travellers back, the full-service carriers tried several gimmicks in the last few months but nothing seems to have worked. According to executives in low-cost carriers, these carriers had sold in February coupons worth Rs 300 crore (Rs 3 billion) to travel agents across the country at a discount price 20 per cent. These coupons were meant to be sold to corporate travellers in bulk by the travel agents. But this wasn't good enough. The migration to the low-cost carriers has only strengthened since then. The routes on which Jet Konnect has been launched, say sector experts, are those on which companies have switched to low-cost travel in a big way: Bangalore-Pune, Ahmedabad-Mumbai, Ahmedabad-Delhi, Hyderabad-Bangalore and Bangalore-Chennai. Jet Airways' strategy is thus clear -- the new service is expected to use the Jet lineage to wean away passengers from the other low-cost carriers. Many observers of the aviation sector say that much of the problems faced by Jet and Kingfisher have been of their own making -- they misread the market when the economy was slowing down and the flip-flops in their fares only went to benefit the low-cost carriers. In January, for instance, all carriers cut prices by 30 per cent, though it did not immediately fetch more passengers. Instead of letting the low fares play for a while, a month later the full-service carriers raised their prices. "The full-service carriers thought they could make more money if they reduced capacity and increased fares. So they did away with their low-end fares. What happened was that their PLF fell dramatically to 50 per cent and they lost more money. 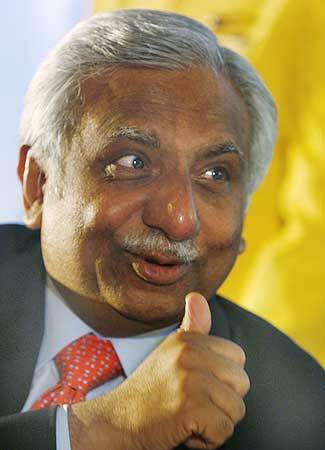 So, the ploy of increasing fares did not work for them," says Gopinath. To add to the confusion, the full-service carriers dropped fares again in March to come closer to the low-cost carriers. Kingfisher announced a 65 per cent cut in fares, which was followed by other full-service and low-cost carriers. The carriers also slashed their fuel surcharge by announcing all inclusive fares of Rs 1,722 and Rs 2,700 on select routes. Then again in April, the full-service carriers increased the fuel surcharge by an average of Rs 250. The low-cost carriers, on their part, quietly rolled back the increase which widened the gap between the two. Can the new strategy of the full-service carriers to shift capacity to their low-cost arms work? Will they be able to stem the shift to rival low-cost carriers? Do they have the bandwidth to drop fares? After all, costs need to be brought down drastically before full-service fares are brought down to the level of the low-cost carriers. If not, there could be a larger financial mess than ever before. Says Sanjay Aggarwal, the chief executive of low-cost carrier SpiceJet: "Our costs are lower by 30 per cent. Not serving meals will give you a saving of just 3 to 5 per cent. The key savings are in better aircraft utilisation, which means better aircraft turnaround and thus higher PLF. The economics on that are very different for the full-service carriers." SpiceJet points out that 15 per cent of the cost savings for low-cost carriers come from utilising the aircraft better compared to full-service carriers and another 8 per cent from cost-effective ticket distribution. Others too are sceptical. "The salaries remain the same in the new low-cost arm. Their cabin crew salaries are slightly higher than those of the low-cost carriers, more so in ground handling. While Kingfisher will shift some aircraft to Kingfisher Red, some of them will still have entertainment systems and other frills which will increase the weight of the aircraft and thereby the costs," says an executive of a low-cost carrier who didn't wish to be named. The low-cost carriers, to be sure, are paranoid about costs. IndiGo, for example, uses a lighter exterior paint to keep the weight of its aircraft as low as possible. The executive also points out that since Jet Konnect' is part of Jet Airways, the time slots and flight schedules will be part of the parent airline's system. In other words, its utilisation of the fleet and the time its aircraft spend idling on the tarmac will be too high. "That it why the time required to prepare an aircraft for its next service will remain 10 minutes higher than a low-cost carrier," says he. That could mean additional costs. On their part, the full-service carriers think they know how to manage the numbers. They have worked out various ways to reduce costs. 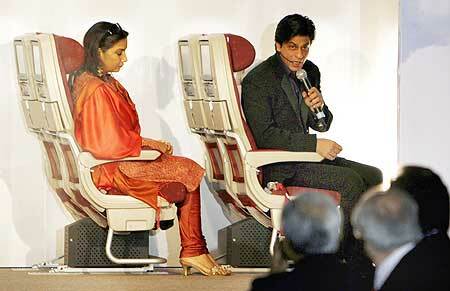 For instance, Jet Konnect will have lesser cabin crew. It is also increasing the number of seats from 164 to 175, which will bring in more revenue. Similarly, Kingfisher plans to reduce the number of cabin crew by around two per aircraft. Jet Konnect is also looking at reducing its distribution costs which are higher than the low-cost carriers because they work on a global delivery system (an international web-based customer relationships management system). Raghavan says Jet Airways has approached GDS operators to lower the distribution costs by as much as 50 per cent from their current levels of $6 per segment. Raghavan also says that Jet Airways can easily change the timings of the Jet Konnect flights if there is a need to improve the turnaround time without disturbing the full-service flights. On the positive side, Jet and Kingfisher have incurred no extra cost to launch the new services. Jet executives say that the eight Jet Konnect aircraft will have to undergo no change in configuration since they were already operating all-economy flights. No aircraft will be repainted. Raghavan in fact says that much is made of the difference in costs. "If we go through the major cost components of the two airline models, these are fuel, aircraft maintenance costs and aircraft ownership costs. And they are no different in our model. In addition to that, we fly to the same airports in the country and pay the same charges." So will the full-service carriers' onslaught to offer customers cheaper fares lead to an all out war with the low-cost carriers? Already, the low-cost carriers are bracing up for the challenge and say that fares might drop another 10 to 15 per cent on select routes. Points out Ajay Singh, a director on the SpiceJet board: "We are surely in a better position to reduce fares than full-service carriers."